This very special evening will feature a 5-course degustation menu expertly paired with an incredible selection of imported Spanish wines. Seats are priced at $135pp including all food, wine and an Estrella Damm Inedit beer on arrival – created by the team of sommeliers at Costa Brava’s elBulli Restaurant. Hosted by Sophie Cotter, Managing Director of St Vincent’s Cave. The evenings wine selection showcases some of the most exciting varietals and regions of Spain and will be expertly paired to an exciting Spanish menu curated by Executive Chef Will Eaglesfield. This evening will also see the launch of exciting new wine drinking technolgy – the Coravin. Coravin uses proprietary patented technology to access and pour wine from a bottle without pulling the cork. Wine enthusiasts can now enjoy wine sealed with corks without feeling the need to commit to the whole bottle, allowing them to explore wines of any vintage, varietal or region, one taste at a time. 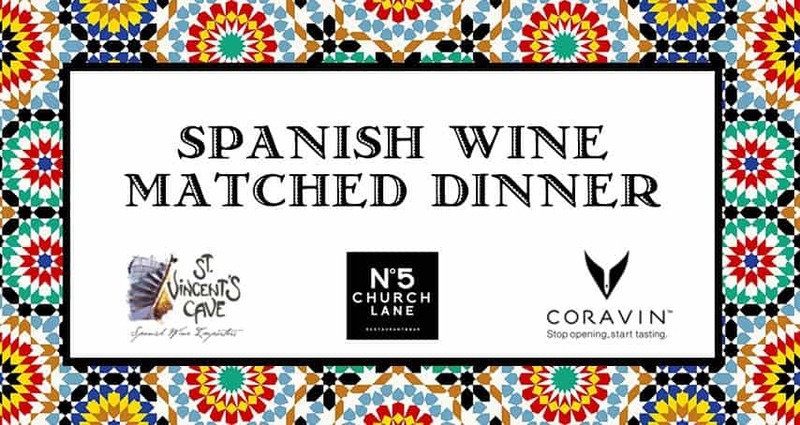 To secure your seats simply email us at info@no5churchlane.co.nz or call us on 03 450 2166.